This post was inspired by another blog I follow and definitely suggest others reading. It's called Mysteries Internal. The author recently went over some of her fears about wading. It made me analyze my own fears and I figured I could best respond in a post. I can relate to this. I'm not sure if it is from watching Jaws when I was five but I really hate wading where I can't see the bottom. Just as spooky are things rubbing against my legs. In San Diego I used to go to the beach at night with friends. There was nothing worse than playing in the water a wave hits you and slides sea weed along your legs. The feeling is indescribable and terrifying. Thinking about it while writing this gives me the heebie-jeebies. I become frustrated and wonder why I don't push myself past the fear. I always wonder, maybe this is a fear everyone has and if I can just push past it I will get to the fish where others were too afraid. My last fishing trip I did just that. 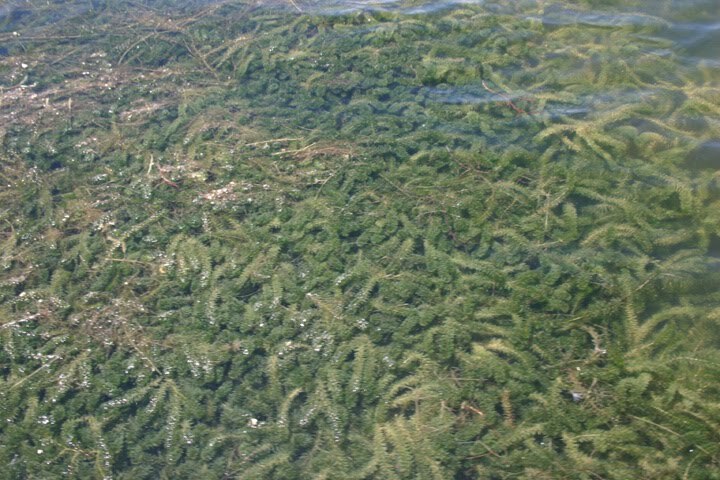 There was a mat of gross green underwater weeds. I guess it is called hydrilla. At least that's what I call it. 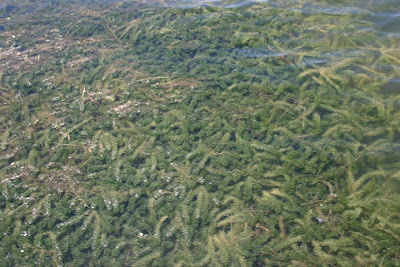 It grows up from the bottom and lays on the surface like an ugly green shag carpet. Your legs disappear when you walk through it and you are in a prairie of unknown water grass. It might sound like heaven to some but to me it's unnerving. What is in this grass? How deep is it under this grass? Why does this grass smell in some places and not others? Is it from other brave waders who died and are now fertilizer for this very plant? Who knows but it does get to me. 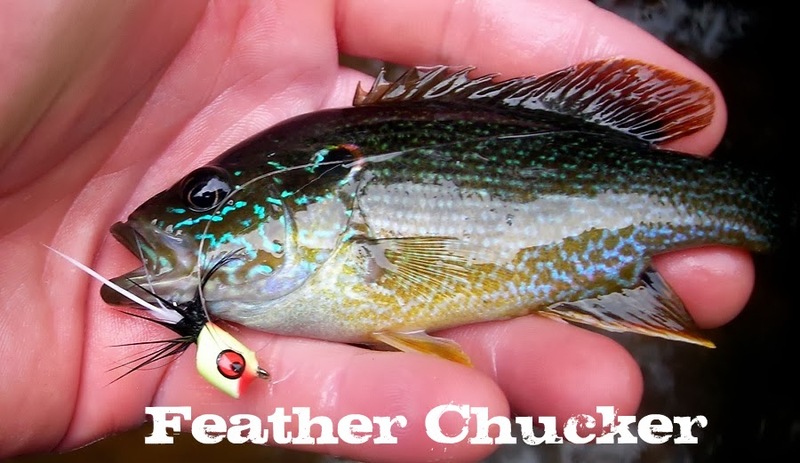 The most silly part is most of this fear could be avoided by carrying a wading staff. I carry so many things already that I feel like a fishing version of a Swiss Army knife. I've been trying to downsize my gear for years. It just doesn't seem right to have a stick in one hand and a rod in the other. Even if it is for safety. That's my dumb logic. When I moved through the grass I was happy that I was trying to face my fears but I couldn't wait to get to the next rock outcropping. There was one point where I was standing on a rock island surrounded by this green muck. I couldn't tell how deep it was on any side. I sort of bent down and tried to edge in with one leg. With every inch my leg went under the surface I kept hoping "please feel the bottom, please feel the bottom." Eventually my foot hit bottom and it was a lot shallower than I expected. But then came the dilemma of taking another step. I reluctantly walked through the grass and tried to not think about what was in it. I just focused on the next rocks I could climb up on. Even though I had walked through maybe 100yds of water without being able to see the bottom and what I was walking through, I was still having a hard time getting up the nerve to walk back through it. Maybe I was lucky and just stepped over a hole that I'd fall in on the way back. I psyched myself up enough to wade back through the grass and my steps would quicken the closer I got to a rock. Once I reached the edge and saw the rocks and stained dirty brown bottom of the stream I was relieved. I'm sure I'll get over my fear some day but it wasn't that day.